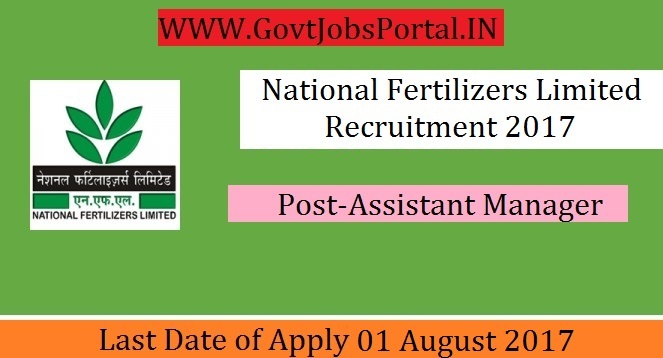 National Fertilizers Limited is going to recruit fresher candidates in India for Assistant Manager Posts. So, those candidates who are willing to work with this organization they May apply for this post. Last Date of Apply 01-August-2017. Total numbers of vacancies are 10 Posts. Only those candidates are eligible who have passed MBA or PGDBM course recognized as equivalent to MBA by UGC/AICTE with specialization in Marketing/ Agri Business Marketing/ International Marketing/Rural Management or Minimum 60% marks in two years’ full time M.Sc. (Agriculture) with specialization in any discipline with Full time regular degree of B.Sc. (Agriculture) with minimum 60% marks. Indian citizen having age in between 18 to 40 years can apply for this National Fertilizers Limited Recruitment 2017. Educational Criteria: Only those candidates are eligible who have passed MBA or PGDBM course recognized as equivalent to MBA by UGC/AICTE with specialization in Marketing/ Agri Business Marketing/ International Marketing/Rural Management or Minimum 60% marks in two years’ full time M.Sc. (Agriculture) with specialization in any discipline with Full time regular degree of B.Sc. (Agriculture) with minimum 60% marks.